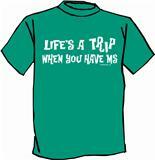 Let's face it "Life's a trip when you have MS". The shirt for all of us who are always tripping over our own feet. In a beautiful shade of Jade. Not quite green. Not quite blue. 100 % cotton Gildan T shirt.